Ready or Not, You Are Leading! This is a guest post from Logan Stout on leadership. Logan is an accomplished business leader, success coach, speaker, and author. Logan’s time in the ministry, business world, pro and college sports, and life form powerful messages as he travels around the world impacting crowds of all types and sizes. You can connect with him on his Website and Twitter. “If you are a leader raise your hand?” This is one of my favorite questions to ask when doing a Keynote speech or speaking engagement, and I’m surprised as to the number of hands that don’t go up. Granted, there is the group of people that won’t raise their hands no matter what anyone says, but generally speaking you would think more would. Bottom line, everyone is a leader. Think about it. Who led each person to either raise their hand or not? They did! They led themselves. At the absolute minimum we lead ourselves. You do in fact have at least a follower of one. Why is it more don’t think they are a leader? I believe the answer goes in line with why most people don’t truly understand both what success is and how to obtain it. Success in my opinion, is reaching your God given potential in life in anything and everything you do. This quest for success doesn’t necessarily have a finish line. Success is more of a journey. A journey to be the best father, mother, son, daughter, boss, worker, athlete, singer, and more. Whatever we do in life, the goal is to be the best version of ourselves in any and all endeavors. The world tells us money, cars, position, titles, and more equates to success. These might be the positive results of moving in the right direction along the success highway, but they don’t define success. Some of the most successful people I know live a very modest lifestyle due to the fact their profession pays a very modest wage. However, they are the best of the best at what they do and take pride in improving day in and day out. We are either getting better or getting worse. Therefore we must understand the keys to acquiring success. I believe the first key to success is personal and spiritual development. It’s during this process we being to take away the layers of what the world tells we should be, and we get back to who God created us to be. Unique and special. We are created in His image, yet we spend so much time working on pleasing the worldly image. It’s when we are true to ourselves we possess a genuine confidence that leads us to move in a positive direction. One of my tag lines at www.loganstout.com is “Personal development liberates the human being to reach their God-given potential in life. ” As I speak around the country on Leadership, Team Building, Personal Development , and more, I’m often asked many questions. The most common question whether I’m speaking in front of thousands or just a small group is, “What would you say your number one key to success has been?” Well, I think you all reading this know the answer by now! I’d love to connect with you all at my website www.loganstout.com where my facebook, twitter, blog, videos, and more can be found. Have a Blessed Day! Logan is an accomplished business leader, success coach, speaker, and author. Logan’s time in the ministry, business world, pro and college sports, and life form powerful messages as he travels around the world impacting crowds of all types and sizes. 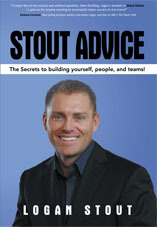 His book, Stout Advice: The Secrets to building yourself, people, and teams quickly became a favorite of individuals, companies, teams, ministries, and more! A 10-time World Series player and coach, a leader of one of the largest companies in the country, and Founder of one of the best and largest baseball organizations in the world leave no doubt Logan knows how to impact individuals, groups, organizations, and companies alike!